Fun With Puzzles Brain Teasers Can you Read this Find the Mistake Picture Puzzles Puzzles Questions Fun Brain Test to prove that your brain is lazy? 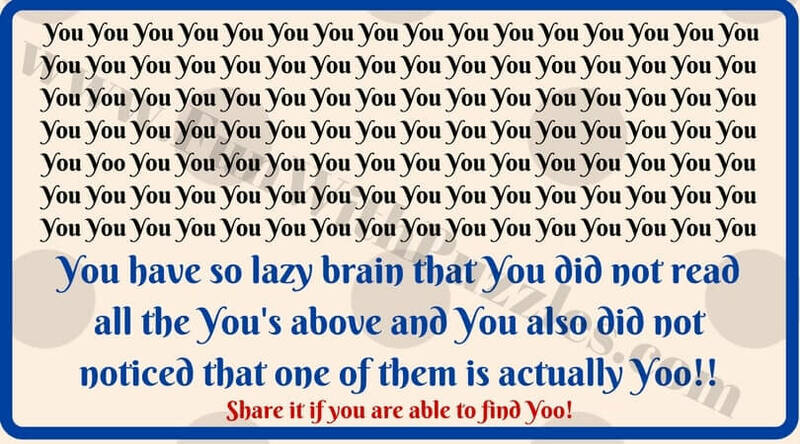 Fun Brain Test to prove that your brain is lazy? When we read something, there are many details are missed which are just passed through by brain. Our brain is so capable that it can get the exact meaning of sentence even after skipping so many details during the process of reading. There are many reading challenges to prove this fact. 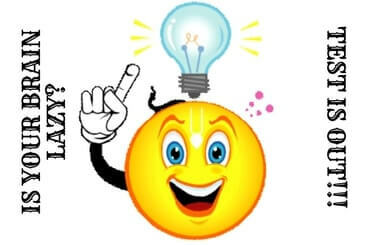 Here are many different fun brain tests which will prove that your brain is lazy. Your brain skips the many information which it may consider is not necessary while reading. In fact your brain tries to save our time by not reading the unnecessary information. However sometimes we miss some important information in the process. This test is designed to see how lazy is your brain. Lets see if you can pass this test. Read the following paragraph in the picture and you will understand that our lazy brain misses many things. Can you pass this fun brain test? Did you read the number in the previous fun brain teaser? Most of the people will miss reading the number :). Lets proceed for the next brain test in which one has to find the mistake in the given picture. Study this picture carefully and try to find the mistake in the puzzle. Can your lazy brain find the mistake in following puzzle in just one scan of this picture? Did you found the mistake in the previous picture puzzle. If not, don't worry, our mind try to skip reading the text which it considers is not required. Our education effects the way we read. If the same text is given to a child for reading, they will read it correct in the first time. You can try similar Finding the mistake puzzles if you liked the previous mistake puzzle. Next puzzle is very interesting puzzles. 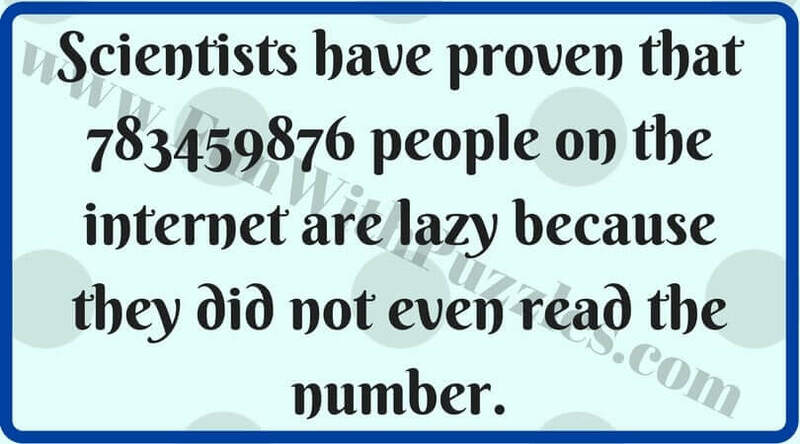 This will definitely prove that your brain is lazy. Now you will be more alert in reading the paragraph. 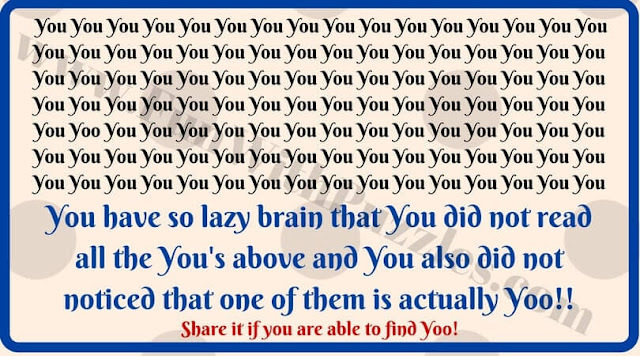 Lets see if you can pass this lazy brain fun test? Are you able to pass this Lazy Brain Test? Next brain teaser is on the similar format in which you have to find the mistake in the given picture puzzle. 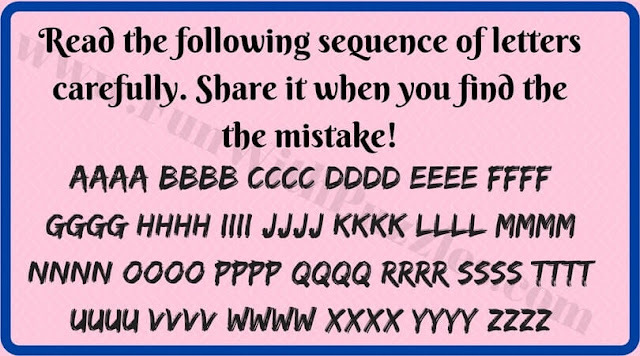 Lets test if you can pass this finding the mistake brain test? Can your lazy brain find mistake in this picture? Were you able to solve previous mistake puzzle in just one scan. If not, don't worry and try again till you find the mistake. If yes, then you have very high IQ because most of the people will miss the obvious errors while reading. If your mind is quick to find the mistakes then you should not miss the Tricky and cool brain teasers of finding mistakes in given pictures. Next one is very interesting brain challenge. You have to find the number of Fs in the given sentence. Can our lazy brain read all the F's correctly in one go? 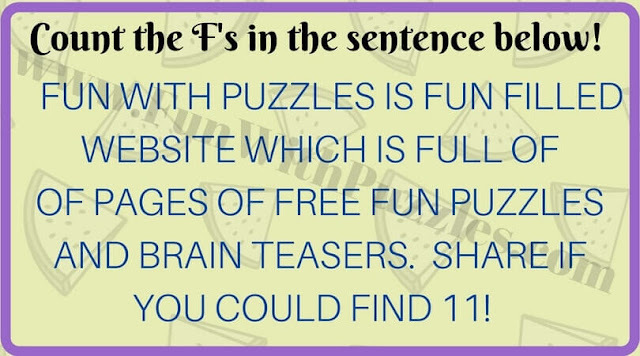 Lets see if you can count all the Fs correctly in this fun brain test? Can you count the number of Fs correct in your first attempt? Could you count all the 11 Fs correctly in the first go? If not, don't worry, there were two things in this brain teaser which twisted your brain. One is our brain tends to skip 'F' in "OF". Another is there were two "OF"s continuously in this picture brain teaser which our mind will tend to skip. In case you could solve all the above puzzles correctly then you have very good observation skills and your mind is very strong. Then you should definitely try out Picture Puzzles for Genius Minds. Till now we were trying to prove that our mind is lazy :). In fact our mind is not lazy but very intelligent to skip the unnecessary details while reading. Our mind is not required to read the full word to understand it. 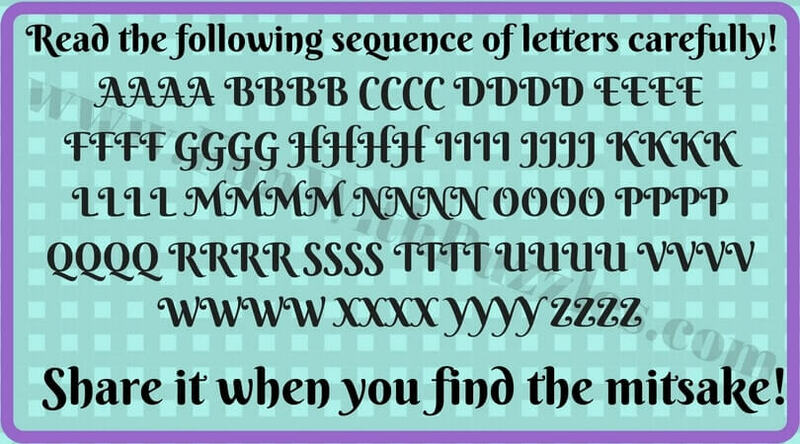 Research has shown that if the letters in the word are scrambled randomly while keeping the first and last letter of the word intact then our brain can read the text without any problem. If you don't believe it, then its time for the next brain test which will prove that our mind is very powerful. Lets see if you can read this Encrypted Quote? 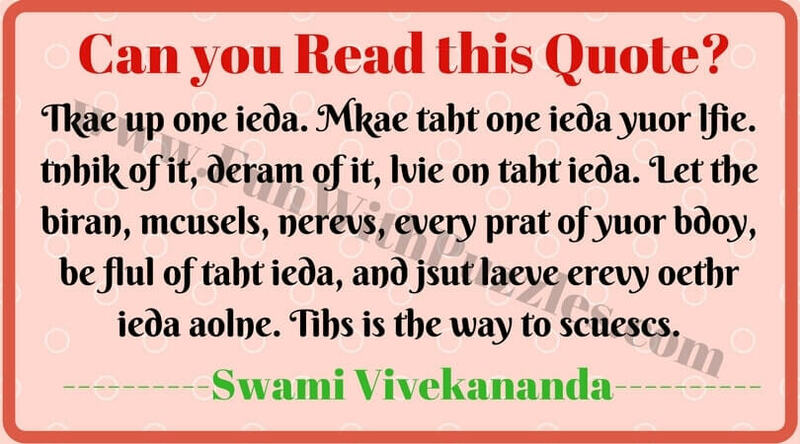 Can you brain read this in first attempt to prove you have active brain? Could you read the encrypted quote in the previous reading challenge? 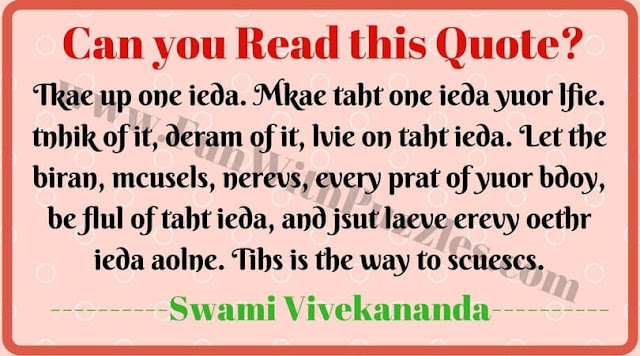 Do try taking this Reading Challenge of Encrypted Quotes by great people. If you loved all these puzzles, please do share it with your family and friends so that they can also have fun. 1. Brain Test to Find Mistakes in Puzzle Images: In this Lazy Brain Test you have solved few puzzles to find mistake in the given picture puzzles. Do take this Brain Test and find out if your observational skills are good enough to find mistakes in Mind Puzzles Pictures. 2. Odd One Out Puzzles for Kids, Teens and Adults: Here is the set of Mind Picture Puzzles in which set of numbers is given. All the given numbers follows certain rules or patterns. There is one number which is different from other given numbers. Can you find this Odd Number Out? 3. Can you find the hidden faces in Pictures? : It time now to check if your visual skills are good enough to find the hidden faces in the Mind Puzzle Pictures. 4. If You Can Read This, You Have A Strong Mind: Here is the reading test. In this test you have to read the text given in Mind Puzzle Puzzles. If you can pass this, then your have a strong mind.